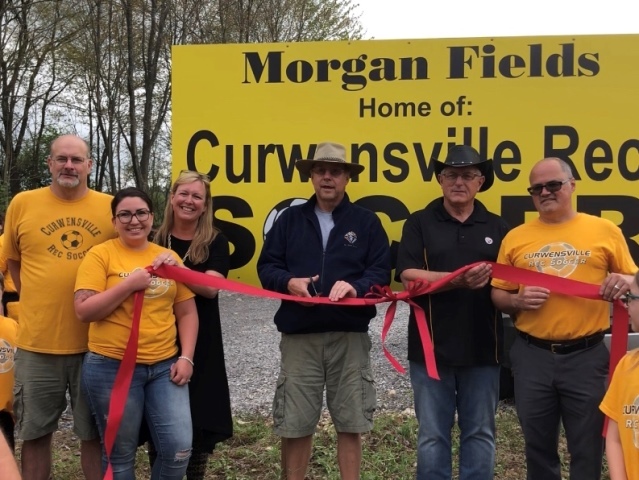 CURWENSVILLE – A ribbon-cutting ceremony was held Monday at Morgan Fields, the new home of Curwensville Rec Soccer. Brian K. Spencer, Curwensville Rec Soccer Association president, took over the project three years ago. The fields are located along Naulton Road in Curwensville. “The project had stalled and I was tasked with reviving and working it until its completion,” Spencer explained. Jack Morgan, landowner, stated he is pleased that the Morgan Farm is providing youth with a recreational soccer facility in the Curwensville area. Steve Keller of DMS Environmental Services helped first by installing the pipe on the driveway. He later moved topsoil to compensate for the slope of the field. Travis Bressler of DJ Contracting constructed the parking lot with the help of Russell Stone Products, which contributed the stone base. In addition, Gary Thorp of Curry & Associates helped with the overall layout and design of the soccer fields. “It really became a community project with businesses helping the association through donations and in-kind services,” Spencer said. Spencer recognized Amy Turner, vice president, who was behind the significant growth in the association’s fundraising. Spencer pointed out that when he and Turner took over they only had enough funds to get through one season worth of apparel and liability fees. 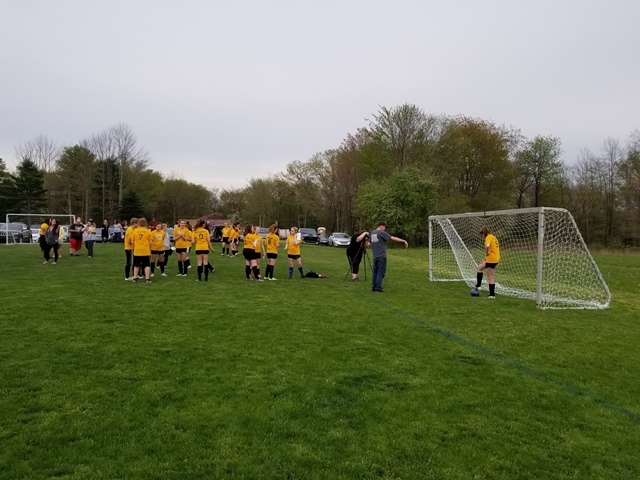 However, under Turner’s guidance, the association was able to pay for a new mower, gravel for the parking lot, new soccer goal nets and to seed the field. “As the association’s president, I would like to thank everyone who has contributed time toward the completion of the field,” Spencer said. Spencer also noted that Steve Addleman, Lenny Rebar, Wilbur Neeper and Larry Frantz are all friends who contributed to the project. The association’s annual fundraiser is set for June 16 and tickets can be purchased from any member of Curwensville Rec Soccer.